The new improved user interface with support of the AutoCAD® like paper style background. Features a new look and “feel comfortable” experience. 2019 (version 19.0.8) just released! AViCAD Professional contains o2c features; 3D Models are easily exported and managed with the o2c tool. o2c is the best Tool for 3D models presentations. The o2c format is not only a 3D-Viewing on internet but also in Microsoft PowerPoint, Microsoft Word, Microsoft Excel, Microsoft Outlook within HTML email. 3 programming languages supported by AViCAD Professional: LISP and SDS (C++ ADS compatible) VBA and COM automation. NLM licenses can be temporarily moved on laptop or remote PC to be used offline. Maximum flexibility! 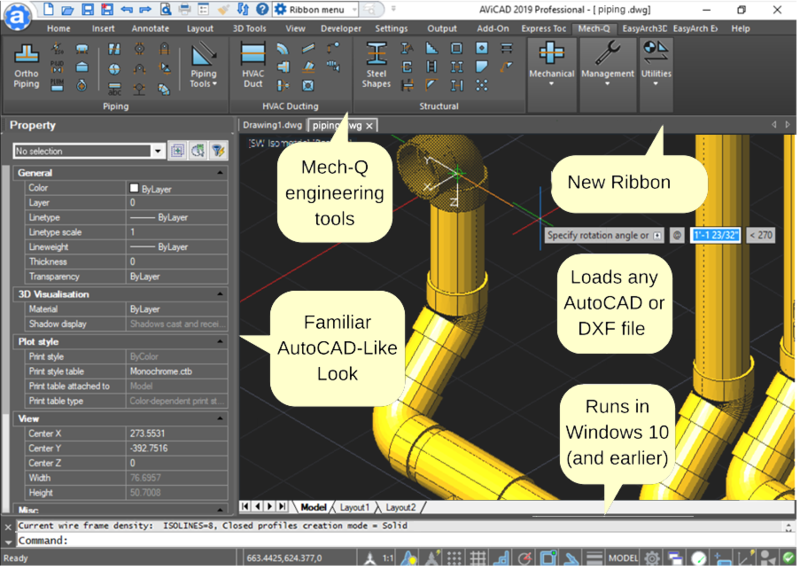 AViCAD supports every important AutoCAD® file type, including AutoCAD® drawings (from 2.5 through 2018), AutoCAD® menus (.MNU), AutoCAD® scripts (.SCR), AutoCAD® AutoLISP routines (.LSP), AutoCAD® Drawing Exchange Format (DXF), AutoCAD® ADS Compatible programs (SDS, Solutions Development System), Windows TrueType and AutoCAD® SHP/SHX fonts, AutoCAD® Tables for plotting (.CTB), AutoCAD® Hatch Patterns, AutoCAD® Blocks, AutoCAD® Linetypes, etc.